Jal Mahadev Temple is one of the famous temple of Balangir. This temple is about 84 KM from Balangir via Khaprakhol. 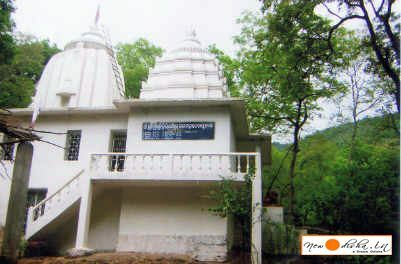 See here to know more about the famous Jal Mahadev Temple of Bolangir. We learn from the Epics that Lord Shiva guzzled poison which trickled during churning of the Deep using Mandara Hill as a shaft. For the welfare of the Universe, He drank the poison that coloured his neck blue. In order to remain cool and composed he let the river Ganges descend from the feet of Lord Vishnu on his mat. So wel called him Gangadhar. Since the moon which signifies coolness adorns his forehead. He is named as Chandrasekhar. Because of this necessity, man probably associated profuse water with the worship of Lord Shiva. Hence during ablutions we use much water and milk to gratify him. Peculiarly Lord Loknath in Puri remains completely ducked under water but unfailingly water dribbles on the Linga at every Shiva Temple. However, like Panchalingeswar, the rarity of Jal Mahadev is that He displays himself(Swayambhu) beneath the flow of a perennial stream. So devotees drop bel leaves and flower on the gushing rill. Picturesque surrounding casts charm and placiditly on solemn presence of the Lord. Moreover, a number of Shiva Lingas are ferreted out at the site which were probably earlier adored by ascetics. This fact oints to antiquity of the site which perhaps was a hub of religious activities. Like Harishankar, dense forest cover enriches the backdrop of a modern temple. The white edifice of Trilingeshwar was completed by Sri A.U.Singhdeo, The Ex-Minister of Tourism, Odisha few years before. The stream amid nature provides ample scope for bathing in privacy. Nature lovers and pilgrims throng the place for picnic and a holy dip., As the destination is located at the foothills of the Gandhamardan, exotic plants, birds, animals, reptiles and insects get full freedom to roam and flock. So a visitor gets solace and real vaalue of his money. For all these reasons, visitors from Chhatisgarh, Madhya Pradesh and Odisha enjoy these two places by own transport. There is a connecting route from Harishankar to Jal Mahadev(6/7 KMs) but it is not motorable nor free of accidents. So if pucca road can be lad for the benefit of visitors and tourists the distance and time will be reduced and journey will be most exciting. The visitors may commune with nature and stumble upon wild animals. Thus they will have a choice for picnic either at Harishankar or Jal Mahadev. But they can pay respect at both the places. In addition, one can visit the Deer Park, Herbal Garden and local market at Harishankar. Trekkers can try a 16 Km route to reach Lord Nrusingh at the other side of the Gandhamardan Hills. Jal Mahadev is 84 KM from Balangir via Khaprakhol. Khaprakhol (16km from Jal Mahadev) is a vintage point and well connected with Balangir, Bargarh(68 km) Nuapada(67KMs) Kantabanji(68KMs) Titilagarh(144 KMs) One is to take a left turn at village Maharapadar(08KMs) on the way from Khaprakhol to Harishankar(13 Km) and reach another village named Kandarabhata which is only One Kilometer away from Jal Mahadev. However, this fag end of the road is not blacktopped and an unstable bridge keeps the are detached during rain. Give Responses for "Jal Mahadev Temple of Balangir"